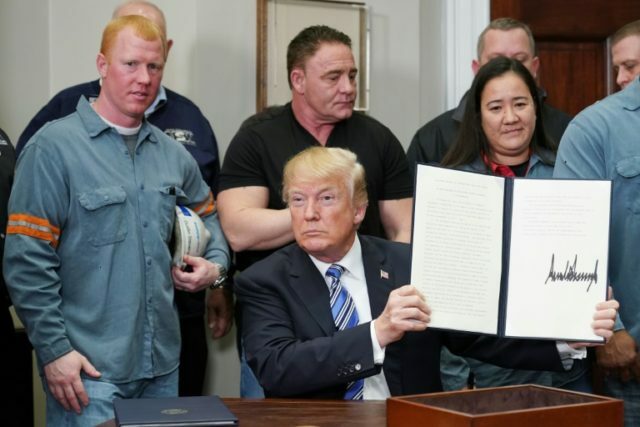 Washington (AFP) – President Donald Trump on Thursday promised to show fairness and flexibility towards America’s “real friends” in rolling out new tariffs of 25 percent on steel and 10 percent on aluminum. But who provides the metals to the United States? Last year, US imports of steel, iron and ferroalloy jumped 38 percent over 2016 levels to $33.5 billion, according to data from the Commerce Department. Canada, America’s neighbor to the north, was the single-largest source, providing 15.6 percent of all imports. Imports of alumina and aluminum rose 32 percent last year and Canada was also, and by far, the largest supplier, accounting for 40 percent of this. By the end of 2017, more than 60 percent of US steel imports were covered by existing trade barriers such as tariffs, according to Chad Bown, a trade expert at the Peterson Institute for International Economics. This was far above the average for most products, which was four percent. Bown estimates that the tariffs announced Thursday will eliminate $14.2 billion worth of annual US imports of the metals. But only $689 million would come from China, with the rest sourced from US military allies in Europe, Canada, Japan and South Korea, according to Bown.